Get ahead with these top tips from Naughty Dog. Fairness first: Setting an even playing field is important, so Naughty Dog has introduced Relics, a currency that can only be earned through gameplay and will be able to unlock all add-ons, present and future. An evolving experience: Over time, Naughty Dog will release a variety of new maps, modes and gameplay items at no additional cost (including co-op), that will introduce new rules and play styles. Downloadable content accessible to everyone: All in-game store items will be unlockable through gameplay at no additional cost. Unified community: The idea of delivering DLC this way was greatly influenced by the goal of having a unified community. Maps and modes will be available to everyone on the same day, at no additional cost. This will ensure that all players are kept together and experience new content at the same time. In Ranked Team Deathmatch, Ranks range from Bronze III to Diamond I. You’ll be awarded points for winning a match, and points will be deducted for losing. When you acquire the necessary number of points, you’ll enter into Qualifiers. At this point, you’re given the opportunity to increase his or her Rank by winning a certain number of the next few matches. Failing to do so will knock the player out of Qualifiers, and he or she must earn points again for another attempt. A fight to the end with teammates at your side. The goal is to score a certain number of points to win, with each enemy KO being worth one point. Grab the idol and return it to your treasure chest for one point. You can throw and climb with the Idol, so don’t given your enemies a stationary target – keep moving! Set up as pseudo competitive matches, you battle against enemy NPC opponents with the goal of getting a high score using specific multiplayer mechanics. Each of the 10 Trials will include different levels of difficulty and will award Relics for completion. Naughty Dog has made a lot of new gameplay mechanics available, and the Warm Up playlist gives players the opportunity to explore them. You will only be able to play in this playlist for a certain number of matches, to help you understand the multiplayer mechanics before joining the fight. In this mode, you’ll capture Command Sites for a steady flow of points, or knock out enemy Captains for a large point bonus. Command emphasises teamwork and a large part of that comes from protecting your Captain. There are a number of Command Sites across each map. When your team captures one, your team’s score will increase. Command Sites captured by the enemy team must be neutralized before you can capture them for your side. Command Sites are captured faster when more members of the team are inside them. Level 1: Enemies see a Captain icon by the Captain’s name. Level 2: Enemies can always see the Captain on radar. Level 3: Captains are automatically Marked until they lose Captain status. Captain status is lost when the Captain is knocked out, which scores the enemy points depending on the level of the Captain. This mode can have some intense comebacks given the large point value a Captain can reach. You acquire Relics by either completing daily Challenges or winning matches, and you can spend them on DLC Chests. You will be able to pick between a DLC Vanity Chest or a DLC Gameplay Chest; when you open it, you’ll earn new items. Neither chest type will ever give you a duplicate item. 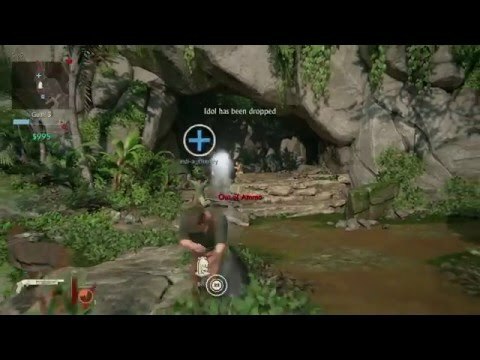 Wrath of El Dorado – When thrown, the El Dorado sarcophagus from Uncharted 1 appears to unleash spirits that track down the enemies near where it is placed, and damage them. 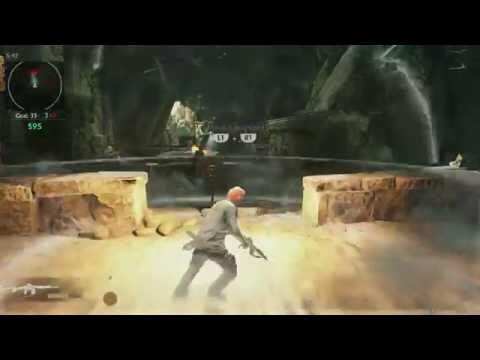 Spirit of Djinn – The Djinn magic from Uncharted 3 imbues the player with the ability to teleport short distances, but they won’t be able to take cover. Cintamani Stone – Activating this mystical from Uncharted 2 revives Downed allies within its area of effect instantly. Staff of Ayar Manco – This staff, from the Uncharted: The Fourth Labyrinth novel, casts a magical force across an entire map revealing where the opposing team is located. It will also show up on the mini-map and can be destroyed. Indra’s Eternity – From the Uncharted: Eye of Indra motion comic, this Mystical slows down any enemy that enters its visible area of effect. Sniper – Defends a location with a sniper rifle to take out members of the opposing team. Saviour – Field medic who will revive Downed players, hand out ammo and help your team replenish their Gear faster. Hunter – When called in, hunts down the nearest enemy and puts them into a hold for the player to KO them. Brute – Heavily armoured with a lot of fire power but slow moving. The opening tutorial takes you through all the basics. Pay attention to the charge melee attacks and in-game store features. After finishing this handy introduction, you’ll be awarded the ‘Continue the Adventure’ trophy. Teamwork, teamwork, teamwork! Uncharted 4 is all about cohesive cooperation and coordination. A well balanced team that plays off each other will be far more successful than a team of lone wolves. If you want further practice, check out the Trials Mode. You can hone your skills with throwables, Sidekicks and Mysticals. You also get the ‘Trials by Fire’ trophy for completing all of the trials on Moderate difficulty. Don’t be afraid to blindfire in cover or while rushing an enemy. Many weapons, especially shotguns, are perfect for no-aim K.O.-ing. Always reload your gun during any down time. You never know when that extra bullet or two will be the deciding factor in a close duel. Don’t be stingy with the throwable items. Keep an eye on their recharge meter, and upgrade to level two to get more throwable potential. You can also throw items by aiming with your gun and tapping R1 to throw them longer distances, instead of the standard arched aim. Charge melee attacks are perfect for getting the drop on a pre-occupied enemy. Use the many maps’ varied side alleys and alternate paths to know when to sneak up and hamstring your opponent’s assault. Customise your loadouts. Once you start to unlock more items and gear, a well-tailored custom loadout will outperform the presets. And remember, you can save multiple custom loadouts, so feel free to experiment with different styles and equipment. Use the traversable environments to your advantage. There are plenty of rope swings to rapidly assault an enemy location or put the aerial takedown on a hapless foe. Super punch them for a humiliating one-hit finisher. As you battle through the snow covered ruins of an old cathedral, be sure to use slides and mining tunnels to cut through the three major lanes of this circular map. Head to the cliff side area for frantic rope based combat and long range sniping battles between opposing perches. The ruins and graveyard at the edge of the woods provide more grounded, cover based play. The dig site in the middle of the map gives you access to all of the major areas of Scotland. Move through the cover of the cathedral to flank enemies in the ruins or crypt area of the map. Use the zip lines for a quick retreat into the two story crypt building from either the cliffs or cathedral. Take over the colourful downtown area of King's Bay and explore three distinct sections: Street, Market and Construction. The Market has two perches on either end that gives you a view of the level, but leaves you exposed. So don’t stay around there too long – use it as a vantage point, then when you need to engage in heated close quarter firefights, duck into the kiosks where there’s plenty of cover. The Street area is a long, open section that’s perfect for sniping, meanwhile the Construction region provides unique rope traversal from building to building for a quick movement from one end of the map to the other. Rather than facing a team of enemies head-on in the Market, utilise the side entrances to flank the enemy via the Street and Construction areas. Navigating the Street region is easier if you have teammates to help suppress the enemy, giving you valuable time to move from cover to cover. Carved into a cliff face overlooking crashing waves, Remnants is a death-trap of old secrets. Swing through the tiered ruins and cliffs of rain-battered mountains, and use the long sight lines for sniping. But don’t stay still for too long, as this ancient den has many dangerous flanking opportunities due to its rope grapples, caverns and hidden walkways. This map favours players who stay mobile and are not afraid to weave through the slippery bluffs. The centre walkway is a powerful defensive position if you have a friend watching your back. The slide in the middle of the cavern can be used in a pinch to escape and manoeuvre around your enemies. Located on a corner of the map long forgotten, Island is a frantic battlefield where you fight through a lush jungle and ancient ruins. Home to many treacherous pits and tight quarters, it’s ideal for using high ground to get the drop on opponents. The Jungle and Falls areas have long sight lines and good cover, so don’t be sparing in their use. And if you need to get around quickly or require a swift escape route, use the slides in the centre caves. The three grapple points in the Pit area are a great way to traverse quickly, but it leaves you vulnerable to gunfire, so use them with caution. The sniper's perch at the top of the Pit has an impressive sight line through the centre caves, allowing you to control the flow of the match. The Falls area has a lot of low cover to make use of, and a grapple point near the spire for flanking. Experience the opulence of the Italian countryside in the dead of night, fighting in decorated galleries and manicured gardens. This level features strong fronts which encourage grouped team fighting in a variety of close-quarter and split-level environments. Cut across the treacherous bridges avoiding enemy fire, or take sweeping grapple rope paths to regroup quickly with your allies. Twin sniper outposts overlook the bridges and towards the gardens and terrace, allowing long-distance support. Avoid fighting near the Sundial. Due to the lack of cover and long sight lines, this area should only be used for quick traversal. Due to the circular direction of movement on this map, and the high mobility traversal paths, flanking is a key element on the rooftops. Always watch your back. Enclosed spaces, such as the gallery room, as well as the many hallways and underpasses, provide good areas for tactical Mysticals such as the Wrath of El Dorado or Indra's Eternity. Take the fight to the Rivers found near Libertalia, where you fight throughout the jungle and old buildings that surround a giant lake. This mass of water has many secrets, including slides that lead to a spire, with a sniper's perch at the end of the map. A series of rope swings throughout the map also allow for fun and frantic traversal, but make sure you land on your feet – one wrong jump can send you falling to your death. Use the rope swings on the edge of the map to sneak around enemy squads and flank them. Feeling outnumbered? Jump into the water in the middle of the map and take the slide to escape your enemies. Use a Wrath of El Dorado Mystical on the first floor of the buildings to get a surprise attack on enemies hiding in the floor above you. Firefights in the long lost Pirate Colony of Libertalia tend to be brief, brutal and fast-paced. Long, decrepit corridors with plenty of low cover create close combat areas, where the possibility of a quick underwater escape keeps you on your toes. Both the Pirate Ship crow's nest and the lighthouse feature long sight lines to the heart of the battlefield, while the grassy areas near the collapsed house offer a temporary reprieve from the action. Bring equipment which is good for flushing enemies while in close quarters – grenades are ideal. The upper levels of the surrounding buildings offer a good vantage point of the battle, and higher ground support could mean the difference between life and death. Remember, this is small and fast-paced map, so you should never linger too long in one place. Join the winning team: with a PlayStation Plus membership you can create an unbeatable squad of adventurers and unearth new friends – and worthy opponents – around the globe.